This highly participative workshop introduces proven techniques for discovering, documenting, and verifying application requirements. In three-tier architecture terms, it covers both the Presentation Services (User Interface) and Business Services (Logic and Rules) layers, and integrates closely with the Persistence (Database) layer. The workshop uses an “outward-looking” form of use cases to define external (Presentation Services) requirements – that is, how a user wishes to interact with a system using various UI technologies. 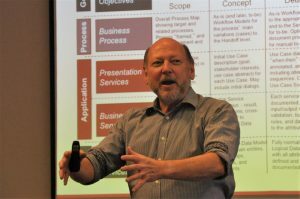 To define internal (Business Services) requirements – the validation, rules, and data updates performed “behind” the user interface – a variety of techniques are covered, including event analysis, state transition diagramming, and service specification. Important synergies between these techniques are demonstrated, as well as making use of the analysts’s other main techniques – data modelling and process modelling. This unique class bridges the gap between two common extremes. At one end are simplistic, easily understood prototyping or list-based approaches that work for simple applications, but are too imprecise and incomplete enterprise-scale work. At the other extreme are techniques that are so complex they are indecipherable to most users and analysts, and thus produce results that are just as undependable. Wrap-up – summary, “what’s next?,” and resources. Understand how use cases and services fit with process models and data models. Business analysts, systems analysts, UX designers, and developers responsible for defining application requirements, or documenting legacy/custom/packaged application behaviour in a structured way. Also, technical specialists interested in requirements definition, project leaders needing to understand current analysis techniques, and content experts with a significant role to play in specifying requirements. None, although some understanding of multi-tier information systems concepts, and data modelling in particular, will be helpful. The pragmatic, integrated approach to business needs and solutions Een gedegen business analyse vormt het fundament voor elke verandering in uw organisatie. Een pragmatische en geïntegreerde aanpak van business analyse door gerenommeerd trainer James Archer. Ontdek de echte behoeften van de business en verbeter processen en systemen.